Always Audacious is a 1920 American silent romance film directed by James Cruze and written by Thomas J. Geraghty. The film stars Wallace Reid in a dual role, Margaret Loomis, Clarence Geldart, J.M. Dumont, Rhea Haines, Carmen Phillips, and Guy Oliver. It is based on the short story "Toujours de l'Audace" by Ben Ames Williams. 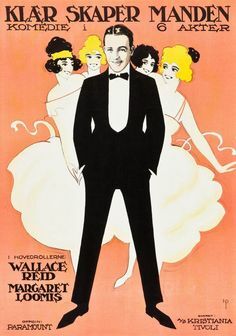 The film was released on November 14, 1920, by Paramount Pictures. It is not known whether the film currently survives, which suggests that it is a lost film. ^ "Always-Audacious - Trailer - Cast - Showtimes - NYTimes.com". nytimes.com. Retrieved 20 January 2015. ^ "Always Audacious". afi.com. Retrieved 20 January 2015. Wikimedia Commons has media related to Always Audacious.